'I feel like this almost is like trying on someone's wedding band,' said the First Daughter. 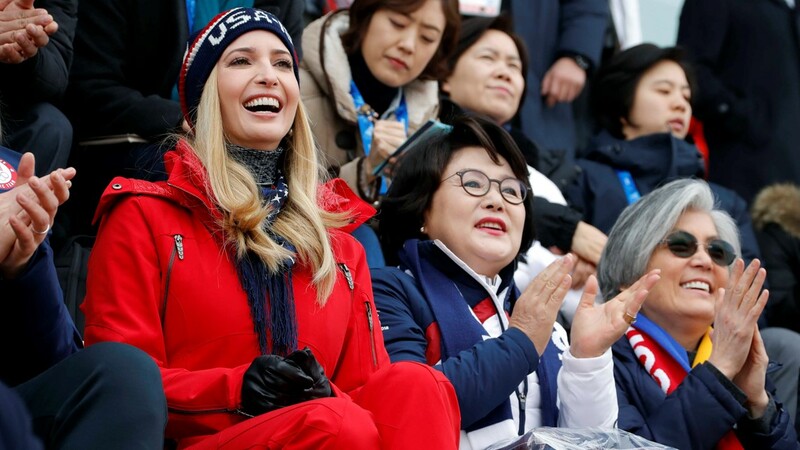 Ivanka Trump got to feel, albeit momentarily, what it’s like to wear an Olympic medal. Team USA bobsledder and silver medalist Lauren Gibbs asked Trump, who was dispatched to South Korea by her father to lead the U.S. delegation to Sunday’s closing of the Winter Games, if she wanted to see what if felt like to carry the marker of one the top sledders in the world. The First Daughter happily accepted the offer. Ivanka Trump poses with U.S. athletes Taylor Morris, Matt Mortensen and Lauren Gibbs on day sixteen of the PyeongChang 2018 Winter Olympic Games on February 25, 2018 in Pyeongchang-gun, South Korea. “That is so cool,” Trump added as she raised the medal with one hand and draped her other around Gibb’s and posed for photos. Trump returned the medal to Gibbs. But then asked to wear it one more time for a group photo with American lugers Taylor Morris, Matt Mortensen and Gibbs. “I told you I wasn’t going to give it back,” Trump joked before returning the medal and thanking Gibbs for being so gracious. Trump spent part of Sunday at the Winter Games watching the four-man bobsled competition. She’s slated to attend the closing ceremony on Sunday.